Wait, my pattern size is what? I’ve been using the incorrect pattern size. For years. How did this happen? It can’t be MY fault, can it? Through tomorrow, Vogue has all its patterns on sale for $4.88 on its website, so I took the opportunity to pick up a few things, including the fitted shell I need to make a new sloper. (I think the last time I did one, my waist was 27 inches. Egad!) Well, fitting shells are sold in a single size only, so I decided I’d better take no chances and read all the instructions to pick the correct size. First a little background on how the Big 4 size patterns. My understanding is that they size their patterns for a B cup. When measuring, if your “full bust” is larger than your “chest” or “upper bust” size (your chest measured under your armpits, not over the fullest part) by more than 2 inches (making you at least a C cup), you are supposed to use your chest size to pick your pattern, then make a full bust adjustment to add the needed fullness just in front. The idea is that the neck, shoulder and back area will fit better this way. OK, fine. I’ve been doing that. Here’s the catch. I’ve been using my “chest” measurement and looking at the chart on the pattern and picking the size with the “bust” measurement that matches. So, last night on Vogue’s site, I saw the full measurement chart. The one that includes both “chest” and “bust” measurements. That’s right, two separate measurements, even though the “chest” measurement is NOT usually on the pattern envelope. So if I use my “chest” measurement and match it to the “chest” measurement on the expanded chart, I find that I need a size larger than I have been using. Do you see a “chest” measurement on here? Neither do I! Now it all make sense! When doing full bust adjustments, I’ve had to add more inches than I thought I should have. And the back shoulder area has been tight. Now, this only goes for the Big 4. 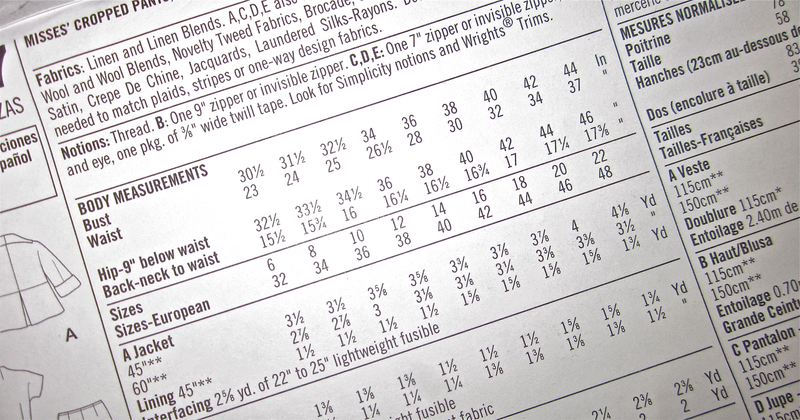 For other pattern companies, it is important to know how they do their sizing. I understand that Colette Patterns, for example, size off a C cup, so I’ll be interested to see how my muslin turns out. The Sencha blouse will be my next project, if I can figure out how to cut silk successfully, that is. OK, OK, time to let go of the annoyance. Now it’s time just to be happy I have found the correct size (no matter how scary-big the number) so I can get better fit going forward. This is a victory, right? An embarrassing one, but a victory nonetheless. ← Yes, I put silk in the washing machine … and the dryer, too!